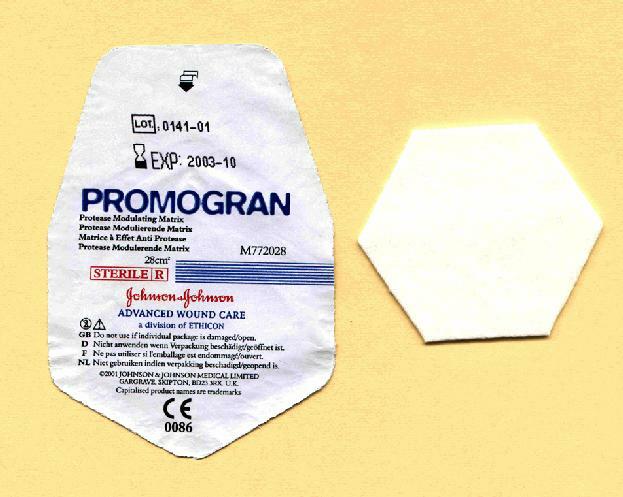 Promogran consists of a sterile, freeze dried matrix composed of collagen and oxidised regenerated cellulose (ORC), formed into a sheet approximately 3 mm thick cut into hexagonal pieces. In the presence of wound exudate the matrix absorbs liquid and forms a soft, conformable, biodegradable gel that physically binds and inactivates matrix metalloproteases (MMPs), which have a detrimental effect on wound healing when present in excessive quantities. The gel also binds naturally occurring growth factors within the wound and protects them from degradation by the proteases, releasing them back into the wound in an active form as the matrix is slowly broken down. Promogran is indicated for the management of all types of chronic wounds that are free of necrotic tissue and visible signs of infection. These include leg ulcers, both venous and arterial in origin, pressure sores and ulcers that occur on the feet of patients with diabetes. The matrix, which also has haemostatic properties, can be used in conjunction with compression therapy. Promogran is contraindicated in patients with known hypersensitivity to either of the components of the product i.e. ORC and collagen. If signs of a sensitivity reaction develop during use, treatment should be discontinued. No safety issues associated with the use of Promogran in the treatment of pressure ulcers, venous ulcers and diabetic ulcers have been identified to date. Before treatment, dry necrotic tissue must first be removed using an appropriate technique. The matrix should be applied directly to the wound using sufficient pieces to completely cover the wound bed. In the treatment of very dry wounds, sterile saline or Ringer's solution should be used to hydrate each sheet prior to application to initiate the gelling process. Once in place the Promogran matrix must be covered with a low-adherent secondary dressing that will conserve moisture and maintain a moist wound-healing environment. The gel that is formed by interaction with wound exudate is biodegradable and need not be removed at each dressing change unless it is necessary to cleanse the wound for some other reason. The interval between dressing changes is determined principally by the condition of the wound. In heavily exuding wounds, it may be necessary to replace the matrix daily initially, but on lightly exuding wounds it may be left undisturbed for 2-3 days. If infection develops during treatment, appropriate antimicrobial therapy should be initiated. No data has been generated to date on the use of this product with topical medicaments. Promogran is presented in a transparent waterproof peel pouch, sealed with a laminated cover and sterilised by gamma irradiation. 1 - Wysocki A.B., Staniano-Coico L., Grinnell F., Wound fluid from chronic leg ulcers contains elevated levels of metalloproteinases MMP-2 and MMP-9. J. invest. Dermatol. 1993; 101: 64-8. Further information on obtaining Johnson & Johnson products is available on the Johnson & Johnson web site. This datacard has been prepared from data provided by the manufacturer and/or from published literature.